Twenty-nine law students at Birzeit University have recently wrapped-up an international humanitarian law course on Thursday, October 18, 2018. Organized by the Faculty of Law and Public Administration together with the International Committee of the Red Cross (ICRC), the three-day course introduced students to basic concepts and principles in humanitarian law, and was led by Ashraf D’aibes and Ayman Awartani, from the ICRC; Salim Qaimari, from the Palestinian Red Crescent Society; and Ashraf Siam, a professor of law at Birzeit University. The course covered topics such as the relationship between international humanitarian law and international human rights law, classification of armed conflicts, persons protected under international humanitarian law, places protected under international humanitarian law, and the role of the International Red Cross and Red Crescent Movement. 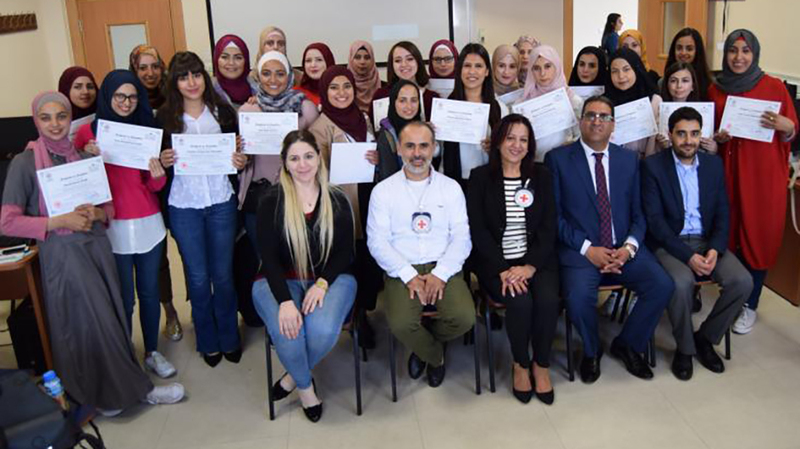 At the end of the course, Yaser Amouri, dean of the Faculty of Law and Public Administration at Birzeit University, and Suha Musleh, head of the ICRC office in Ramallah, presented participants with certificates of attendance.